First, for those of you who are brand new to hot tub maintenance, you should understand what those chemicals are meant to do. Generally, you’ll need chemicals to do four things: sanitize, shock, and balance alkalinity and pH levels. Some of these have more potential to impact your hot tub than others, but all four categories are important to keeping your hot tub operating properly. This category is probably the one most people, even non-hot tub owners, know about. Sanitizers include chemicals like chlorine, bromine, and biguanide sanitizer, as well as mineral sanitizing systems. Imbalance of your chosen sanitizer can cause changes in the color of the water, and with too little sanitizer, can lead to a build-up of organic contaminants. You may need to use additional deep cleaning mixes or replace the filter if this happens. Occasionally, your hot tub will also need to be shocked. If you use chlorine, shock works to oxidize dead chlorine (plus organic contaminants that may be gunking up your hot tub) and helps it evaporate. For bromide, the shock interacts with non-working bromides and ‘jump-starts’ them into working again. In a sense, shocking your hot tub is akin to giving it a boosted dose of sanitizer. Of course, you’ll need to check your sanitizer levels before and after to bring levels back to where they ought to be. These two are a bit more important for the inner workings of your hot tub. While sanitizer imbalance can cause things like calcium build up and clog your filter, alkalinity and pH levels can have a greater effect. If you remember anything from high school chemistry, you’ll recall that pH is the measurement of is how acidic or basic something is — and yes, that’s acidic as in acid. Alkalinity is a pH stabilizer, something to keep pH levels from changing drastically. If the pH and alkalinity levels are too high, the water will be dry (think about how baby powder makes your skin feel) and basic enough that your heater has to work harder to heat the water. Levels can be decreased with a pH decreaser. 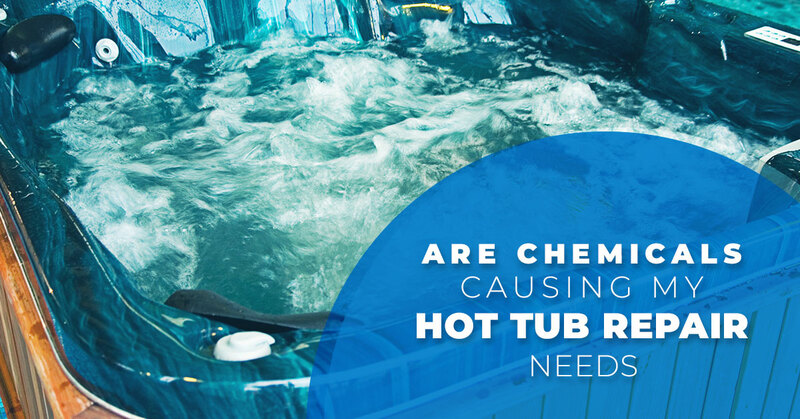 If the pH and alkalinity are too low, however, that means the levels have dropped into acidic territory and this can cause serious damage to the inner workings of your hot tub, especially the heater. This is why it’s important to regularly check the levels in your hot tub. For more questions about the maintenance of hot tubs and spas, turn to your local experts. Summit Spas of Windsor offers more than just new and reconditioned hot tubs and spas; we are also here to help with all of your spa service and repair questions. Contact us today for more!